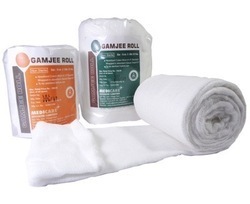 Exporter of a wide range of products which include gamjee roll and sterile gamjee roll. 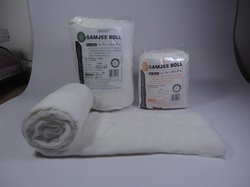 Abiding by the ethical norms of the industry, we are engaged in manufacturing, supplying and exporting Gamjee Roll. Extensively used to dress infected wounds, these rolls are manufactured in compliance with industry laid guidelines and using quality-approved material obtained from the authentic vendors of the market. Stringently tested on certain established parameters of quality before the final dispatch, these rolls are made available by us in various specifications to meet the needs of the customers. 10 cm X 3 mtr. 15 cm X 3 mtr. Port of Dispatch: Mundra Port , Gujarat State, India. Abiding by the ethical norms of the industry, we are engaged in manufacturing, supplying and exporting Sterile Gamjee Roll. Extensively used to dress infected wounds, these rolls are manufactured in compliance with industry laid guidelines and using quality-approved material obtained from the authentic vendors of the market. Stringently tested on certain established parameters of quality before the final dispatch, these rolls are made available by us in various specifications to meet the needs of the customers.